Share your projects online and offline. App players for iOS and Android. For events, online & print media campaigns, exhibitions etc. Includes branded apps for iOS & Android. Branded landing pages for instructions. Includes one app project for iOS and Android. *Our fair usage policy applies. Includes Onirix watermark. We offer full access for educators and all of their students at special rates for an entire year. Our developer plan is meant for mobile application developers that want to build custom AR applications, modify code or do anything that involves our SDK. Our creative plan is meant for content creators, artists, educators and technical sales that would like to create personalised augmented reality experiences, demos, use AR in classes or simply evaluate the technology for a client. Both account types have an initial trial period of 10 days to give you the chance to try out Onirix with no strings attached. If you need any help during your trial or just want us to know what you think, don’t hesitate to contact us via support@onirix.com. After 10 days you can upgrade your plan to a paid subscription and simply keep using Onirix. How can I earn money with Onirix? Onirix allows you to develop custom apps for yourself or your clients that make use of Augmented Reality. 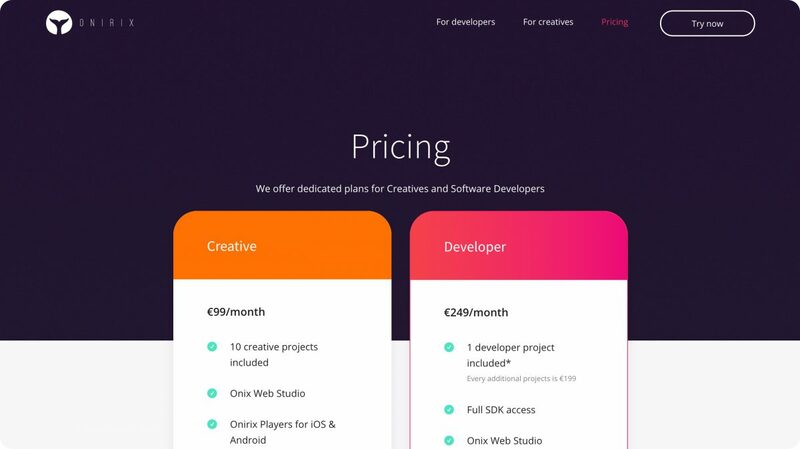 As we are providing an easy to use development environment, Onirix saves you thousands of Euros on development and reduces your market entry time significantly. Our developer accounts give your access to the SDK and a project token which allow you to publish your own apps inside the App Store and Google Play. As we want you to benefit if you are using Onirix for more than one project, we offer additional discounts to power users. What is a project in Onirix? Creating a project in Onirix Studio is usually the first step when creating a new experience. For creatives this is usually a scene, a visualisation or a demo. For developers a project usually translates into a mobile application or a customer project. Please note that you can have multiple target platforms inside the same development project. How can I add or remove projects to/from my developer account? Every developer account includes one project. Whenever you create an additional project inside Onirix, we will guide you through the check out process as every additional project changes the price of your subscription. You can remove projects at any moment from your account. To do so, visit the projects page of your account and remove the desired project using the context menu option. What happens to the projects that I have created during my trial period? If you are using a creative account, all your projects remain in the same place. If you are using a developer account, we’ll guide you through a process that allows you to select one or more projects that you’d like to keep. Please note that for developer accounts only include one project. Please check our price list for additional projects. Transfer volume is the amount of data that travels between Onirix Studio and your mobile applications. Whenever a scene is visualised inside Onirix Studio or inside an app, content like 3D models, images or data sheets are downloaded from our cloud infrastructure. As long as this content is not modified, it is only downloaded once during runtime. Let’s take a look at a few different examples. A 3D enhanced product catalog has about 1.000 views per months. This catalog includes ten 3D models between 5 and 10 MB each. This project would use about 50 GB of transfer volume per month. In an industrial environment, an application is providing overlaying descriptions and repair instructions for the different components of electrical cabinets. This application exclusively uses 2D models and has only 20 users, as this a company specific application. As the models are in 2D, the per user transfer volume is about 20 MB which results in an overall transfer volume of about 400 MB per month. In an advertising campaign, an animated scene is being used to promote a new product. The product is a placed inside a highly detailed 3D scene with different characters, textures and animations which have a total volume of 25MB. For an expected of 30.000 monthly views, the transfer volume is going to be around 750 GB. As this exceeding the included transfer volume, a custom plan would be required. When do I need a custom plan? The transfer volume coming with a creative account will hardly ever be exceeded. The included transfer volume of a developer account is sufficient even for apps with a high amount of users. However, if your project requires a bigger transfer volume than provided, please contact us via payments@onirix.com for a custom plan. What happens to a project that has exhausted its transfer volume? This is something that only concerns a very small percentage of our users. However, we notify you via email in case you exceed 50%, 70% and 90% of your transfer volume. Our support is going to get in touch with you before you exceed your entire transfer volume and move you to a custom plan. Go to the payment page inside the Onirix web interface. Please note that cancellations happen immediately and you lose access to your projects. We also stop charging you immediately. If you’d like to reactivate a cancelled account, please contact us via payments@onirix.com.